One of my favourite pictures. 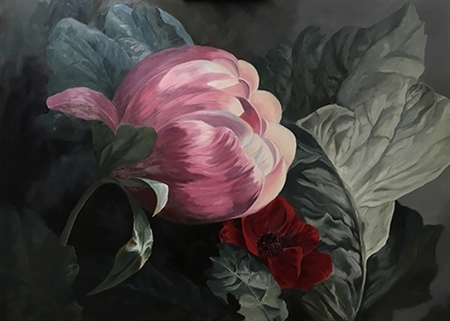 Again it is in the Baroque mode featuring a peony from our vase and much modified brassica leaves from our vegetable/herb garden. Unlike my first thoughts in Blooms in the Brassica it is in a landscape rather than portrait format. This allowed me to emphasise the arc of the painting and highlight the spot lit leaf.